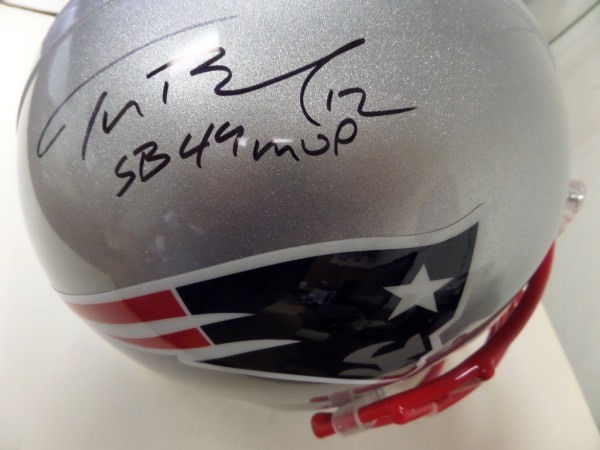 Coach's Corner - Tom Brady #12 autographed/guaranteed Full Size Patriots helmet with "SB 49 MVP"
Go Back to Lot List Tom Brady #12 autographed/guaranteed Full Size Patriots helmet with "SB 49 MVP"
This mint full size Riddell helmet comes signed perfectly in black by the greatest QB ever with his #12 and "SB 49 MVP" included. Very rare inscription from Tom Terrific and retails well into the low thousands. First ballot lock HOFer and a must for the Pat's collector.